Do your summer plans include a visit to Russia or the U.S.? Find out the steps needed to get a visa. It’s no secret that Americans need a visa to travel to Russia and Russians need a visa to go to the U.S., and there is no end to the complaints about the process on both sides. But what is it really like? There are several steps a Russian citizen must go through to get a tourist (also known as a B-2) visa to the U.S. The process can take several months, so Russians who want to go on an American vacation should make plans well in advance. The first step is the payment of the non-refundable visa application fee. For tourists it is usually $160. After filling out the application form, the hopeful traveler must schedule an interview with a consular officer either at the U.S. Embassy in Moscow or at one of the other three U.S. consulates in Russia. At the interview, the applicant must present the following required documents: a printed copy of the appointment letter, the DS-160 (visa application) confirmation page, one recent photograph, a current passport and all expired passports. 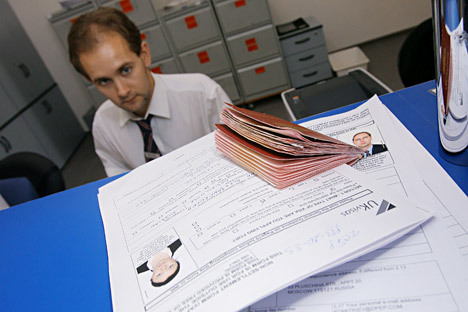 The potential tourist can also bring supporting documents to show that he or she is a law-abiding productive citizen, including proof of employment and salary, a letter confirming a bank balance or other proof of financial activity, a travel itinerary, and criminal or court records explaining any arrest or showing a clean criminal record. At the interview, applicants are also fingerprinted. If an applicant intends to stay in the U.S. long term, he or she must also undergo a full medical examination at one particular authorized center in Moscow. A decision on whether or not a visa has been granted must be made within 60 days. Russian consulates in the U.S. take a different approach. They require official confirmation of a travel itinerary as part of the visa application process. The applicant must show his or her hotel reservation and consular officers must confirm that a tourist has a sponsor in Russia (this is usually a travel agency). Americans also have to pay a non-refundable $160 visa application fee and fill out a long detailed application. American applicants for Russian visas do not have to be interviewed and visa applications can even be submitted by third parties. Applications must include a completed visa application form, a current passport, one standard picture, and a money order for $160. Russian Consulates warn that they can also request a bank statement, a statement from the employer regarding the applicant's wages, medical insurance, and a certificate naming the members of the applicant's family. The Russian Embassy makes a decision about whether or not to issue a visa between 4 and 10 calendar days after the application is submitted. Even after paying the fee and submitting the paperwork, there is no guarantee that a visa will be issued. Reasons for visa denials are almost always unknown, which leads to much speculation on the part of unfortunate applicants. The U.S. consulate advises applicants to bring supporting documentation showing that they have no intention of overstaying their visas. In response to this advice, Russians have been known to bring in family photos or letters from relatives and friends in Russia. The Russian consulate says it reserves the right to decline a visa for any reason. According to experts, the best way to avoid a Russian visa denial is to work through an agency specializing in Russian visa services.